Part Used & Method for Pharmaceutical Preparations: Silkworm excrement is collected from June to August, then dried in the sun. Meridians: Liver, spleen and stomach. Functions: 1. To dispel wind and dampness; 2. To harmonize the stomach and transform dampness. 1. Damp-heat obstruction syndrome. Silkworm excrement (Cansha) is used with Tetrandra root (Fangji), Coix seed (Yiyiren) and Talc (Huashi) in the formula Xuanbi Tang. 2. Turbid dampness blocking the spleen and stomach manifested as vomiting, diarrhea, cramps and abdominal pain. 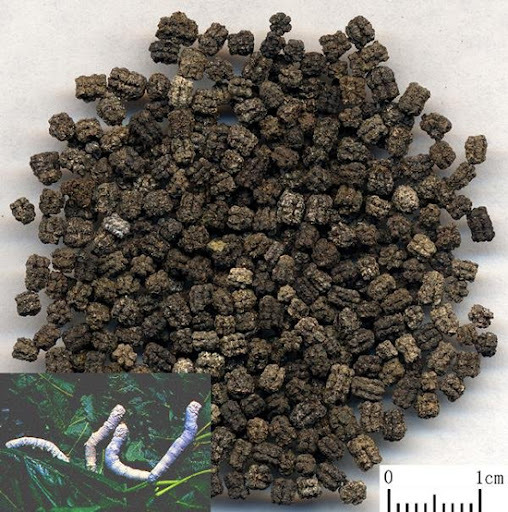 Silkworm excrement (Cansha) is used with Chaenomeles fruit (Mugua), Scutellaria root (Huangqin) and Evodia fruit (Wuzhuyu) in the formula Canshi Tang. 3. Eczema. The decoction of the herb is used for external washing.